This DVD covers every moment of each of the 5 events which were as follows in this order: 1. The Austrian Oak log press – won by Zydrunas Savickas 2. The Timber Carry – won by Hafthor Bjornsson 3. The Longbar Tire Deadlift – won by Brian Shaw 4. The Bale Tote – won by Brian Shaw and 5. The Cyr Dumbbell – won by Brian Shaw. The 27th Arnold Classic was held in Columbus, Ohio on March 5-8, 2015 at the Greater Columbus Convention Center and the Battelle Grand Ballroom. 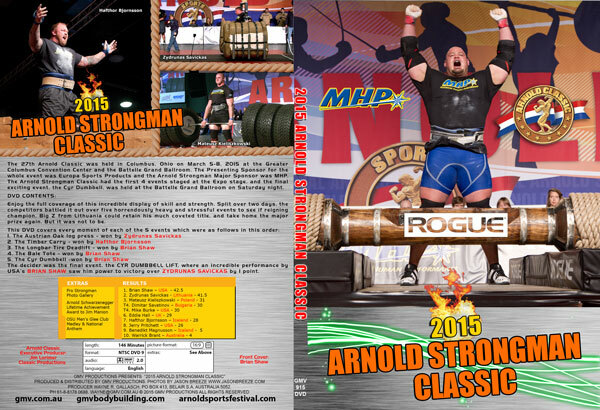 The Presenting Sponsor for the whole event was Europa Sports Products and the Arnold Strongman Major Sponsor was MHP. The Arnold Strongman Classic had the first 4 events staged at the Expo stage, and the final exciting event, the Cyr Dumbbell, was held at the Battelle Grand Ballroom on Saturday night. Enjoy the full coverage of this incredible display of skill and strength. Split over two days, the competitors battled it out over five horrendously heavy and stressful events to see if reigning champion, Big Z from Lithuania could retain his much coveted title, and take home the major prize again. But it was not to be with Brian Shaw winning 3 of the 5 events. The decider was the final event, the CYR DUMBBELL LIFT, where an incredible performance by USA’s BRIAN SHAW saw him power to victory over Zydrunas Savickas by 1 point.